In recent years, power electronics and microelectronics have seen groundbreaking advancements with the application of electric drive systems and motor control technologies, permeating almost all aspects of modern life from transistors, capacitors, washing machines, and air conditioners to elevators, motor vehicles, monorails and centrifuges. Today’s Microcontroller Units (MCUs) bring great precision, efficiency, and lowered costs to a wide range of applications including appliances with blowers and compressors such as washers and refrigerators, HVAC (Heating, Ventilation and air Conditioning Systems), as well as automotive control systems. 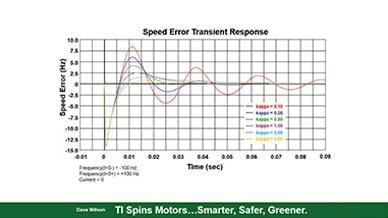 TI’s InstaSPIN™ enables designers to identify, tune, and fully control any type of three-phase, variable speed, sensorless, synchronous or asynchronous motor control system. It uses TI’s new software encoder, a sensorless FAST™ (Flux, Angle, Speed and Torque) observer, embedded in the read-only-memory (ROM) of Piccolo devices. Dave Wilson, Senior Motor Systems Engineer with the C2000 group, was tasked with a project to characterize the FAST™ observer and develop a datasheet for it. He tried to do this by setting up a dynamometer (dyno) system with a circuit board to control it. He intended to characterize the FAST™ observer by varying the error in some of the gain terms and observe its performance. This presented a challenge, as not only was it a slow and tedious process due to output variances over time and temperature changes, it also required constant recalibration. Additionally, the electromagnetic torque could not be measured on the dyno, only the shaft torque could. This was a problem since the software could not be properly tested as the hardware he was using was not adequately equipped to test it. Mr. Wilson had first become familiar with Altair Embed while viewing a web based presentation 4 years prior. Recalling how easy it was to use, he decided to try it for his current project. Altair Embed provided him with a solution to create fast and accurate simulations of motor analog dynamics as well as the digital control. He was then able to automatically create C code from the controller portion of his graphical diagram, and download the code to run on the Piccolo target. Using the Altair Embed JTAG Hotlink in a new synchronous mode, Mr. Wilson could run the motor simulation in lock step with the control running on the target in non real-time. This allowed Mr. Wilson to verify controller operation against any motor configuration, no matter how big or small. It also allowed him to take part of the simulation and interface it to the FAST™ observer. He developed an Altair Embed simulation of the entire system except for the FAST™ piece of code. He could now control any gains he liked. Different parameters like resistances, inductances, controller gains and voltage tolerances could now be controlled as well. “I could then characterize what the FAST™ observer in ROM would give me, and I could compare that to the ideal answer from the simulation. The bottom line is, Altair Embed completely solved the problem that I was running into,” said Mr. Wilson, “A key benefit to using Altair Embed for this project is its code generation capability and how quickly and fast it works. The speed of how its drivers work and being able to interface directly with our ROM code was really the key enabler for me, and that was the most important benefit in this particular project,” he concluded. Deriving the solution using Altair Embed not only allowed generation of the FAST™ TRM (Technical Reference Manual), it also resulted in a very useful tool. 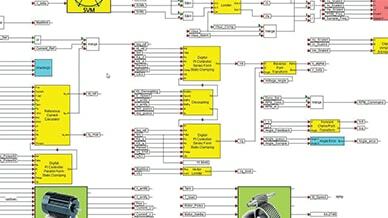 A tool which can enable TI’s customers to test their motor control requirements using TI’s actual ROM based algorithm that they would have never before been able to do without having to hook up an actual motor system. This gives them a quick way to kick the tires on InstaSPIN™ FOC (Field Oriented Control) without having to build a whole system for it. 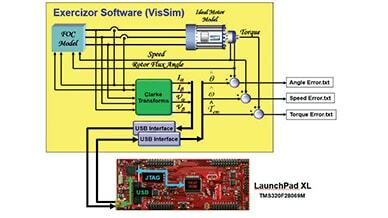 Texas Instruments (TI) is a 13 billion dollar, global semiconductor design & manufacturing company. The C2000 MCU group at TI takes the best parts of Digital Signal Processing (DSP) technology and microprocessors to craft the ultimate embedded control solution. The C2000 focuses on high end processing applications like sensorless field oriented motor control.